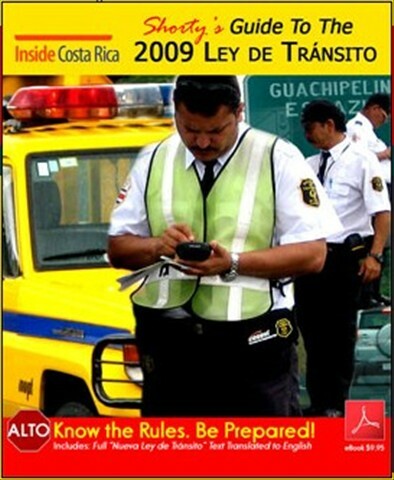 The new Ley de Tránsito goes into effect on Monday, as it was written and approved by legislators back in December 2008. Although the introduction of the full legislation was pushed back to September 23, 2009 and then March 1, 2010, to allow for discussion on amendments, legislators could come to full agreement what those amendments should be. In fact, legislators on Monday will have wade through some 213 motions made during the past couple of weeks. At the heart of those motions are changes to the high fines that will form part of the driving experience in Costa Rica on Monday and changes to drinking and driving provisions that now limits the blood alcohol content at 0.75, after which drivers are hauled to jail. So, on March 1, drivers in Costa Rica will face a new system of fines and points for various infractions, fines severe enough to deter bad driving and a point system that can lead to temporary and permanent suspension for repeat offenders. On Monday all drivers will begin the day with 50 points on their licenses. Each driving offence comes with a determined number of points deducted. When the number of points hits 0, the license is suspended for up to two years, and permanently for repeated suspensions. Drivers, however, with good behaviour can redeem the lost points over time. Driving over 150 km/h, driving under the influence of alcohol or drugs (impaired), for instance is 50 points, in effect automatic suspension, in addition to the ¢227.000 colones fine. Driving without a license or a suspended license is 25 points and a ¢227.000 colones fine. So is driving a gypsy taxi or “taxi pirata” as they are known in Costa Rica. Talking on a cellular phone while driving is 20 points and a fine of ¢170.250. So is not stopping at a stop sign or a red light or yielding to traffic. Driving with tinted windows in the back window is 10 points and ¢90.800. So is driving with too many passengers (overcrowding the vehicle based on the passenger limit as set out in the vehicle’s registration). Not have the vehicle’s registration in the vehicle or taxi and bus drivers insulting passengers does not impose a point loss but comes with a fine of ¢45.400 colones. Not stopping to pay tolls or blaring speakers from a vehicle will cost the driver ¢22.700 colones. Facing loss of points and heavy fines are also the failure to restrain children under the age of 12 in a child restraint and in the back seat. Failure to buckle-up and to insist on all passengers, front and back, to buckle-up comes with a stiff fine and points for the driver. The ministro de Obras Públicas y Transportes (MOPT), Marco Vargas, said on Thursday is asking Tránsitos (traffic cops) to use discretion and not fine drivers for minor offences, taking the opportunity to educate, rather than punish. The policy would be in effect for at least the first 60 days. However, no word has come from the country’s top traffic cop, Germán Marín, whose 1.200 Tránsitos are the responsibility to enforce the law. American Airlines announced today that it will expand its international presence in New York this spring with three new routes between John F. Kennedy International Airport (JFK) and San Jose, Costa Rica; Madrid, Spain; and Manchester, England. The new flights to San Jose will begin on April 6, while service to Madrid will start on May 1, and flights to Manchester will begin on May 13. The new San Jose flight, Flight 611, will depart five times a week from JFK, every day except Friday and Sunday. American will fly its Boeing 757 aircraft with 16 seats in Business Class and 166 seats in the Coach cabin on the route. Costa Rica is a land of extreme beauty, and one of the most biologically diverse, and warmly welcoming countries in the world. Its name – which translates into “Rich Coast” in English – was originally given by Christopher Columbus in 1502 when he claimed the region for Spain. Costa Rica is located on the lower part of Central America, bordering the Caribbean to the east, and the Pacific Ocean to the west. Costa Rica is known for its amazing ecological systems, excellent climate and extremely friendly people. Laura Chinchilla was on Sunday elected as the first female president in Costa Rica’s history, winning the popular vote with a 46.8% support with 94.2% of the ballots counted. Chinchilla’s win was apparente within a few hours of the closing of the voting, as rivals Ottón Solís and Otto Guevara declared defeat, not even waiting for the vote count to reach the half way mark. Solís was the first to accept the Chinchilla win, congratulating Laura and promising that this would be his last campaign, moving on to others things, paving the way for the others. Guevara, moments later announced defeat but with a triumphant voice, claiming victory for a party that won more than 20% of the vote, a big win over the 9% support of 2006 and vowed the party to the presidency in 2014. “With a lot of respect, we accept the reality,” said Solis, who was just 1 percent of votes away from a victory in 2006 elections. Chinchilla told her supporters gathered at the Crowne Plaza Corobici as the country’s next president, whe would keep all she promised during the campaing. “We don’t receive a bounced cheque from the people. To the contrary, we have shouldered solemn obligations to hold dialogues with all parties and social sectors,” she said. Chinchilla’s campaign platform included improvement of the country’s infrastructure, creation of a progressive income tax and new jobs with “green jobs” initiative. She also has promised to create more job opportunities, better living conditions for children and senior citizens, as well as to combat crimes and drug trafficking. Laura became the first female ministra de Seguridad from 1996 to 1998 and held the post of first vice-president in the Arias administration from 2006 to 2009, resigning to run for the presidency. Voting began at 6am sharp, as all the 6.000 voting centres were in syncronized time with the Tribunal Supremo de Elecciones (TSE) and closed promptly at 6pm. 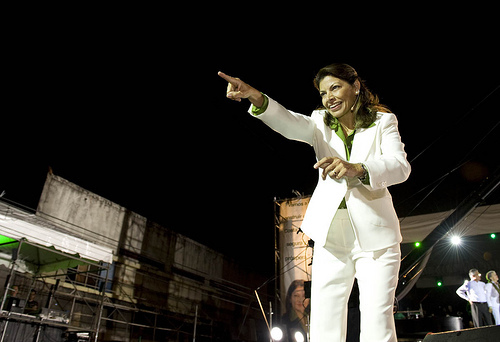 At 8:15pm, Luis Antonio Sobrado, president of the TSE, announced the first voting results, showing Chinchilla with a firm lead, with more votes than her two main rivals combined. Costa Rica is the only Latin American country which in 60 years has enjoyed democratic elections without interruption, said Emma Maria Mejia, chief of an observer mission from the Organization of American States (OAS).